The forecast was for rain and Southerlies, but the day dawned bright and sunny and thankfully the weather forecasters had it wrong and it stayed lovely all day! The kids all unfortunately deserted us, and so after a mad dash around town delivering them to their various other activities, Andrew and I headed over to the club, launched ‘Puff’ and headed out to put the numbers on Wildy! A couple of months ago Wildwood was ‘wrapped’ but at the time we weren’t sure if I wanted to replace the sail number which was on the bow. After she was done, though we all agreed that she needed a little something to break up the red on the front. So Dan from Boat Coat sent some swirly numbers down with instructions to call him before we did it to get some advice on how to apply numbers. Naomi and Justin turned up ready for the racing and added another couple of hands to help. We were pleased with the result! Unfortunately we missed the parade of sail – where all the boats line up with their flags and parade around the inner harbour. 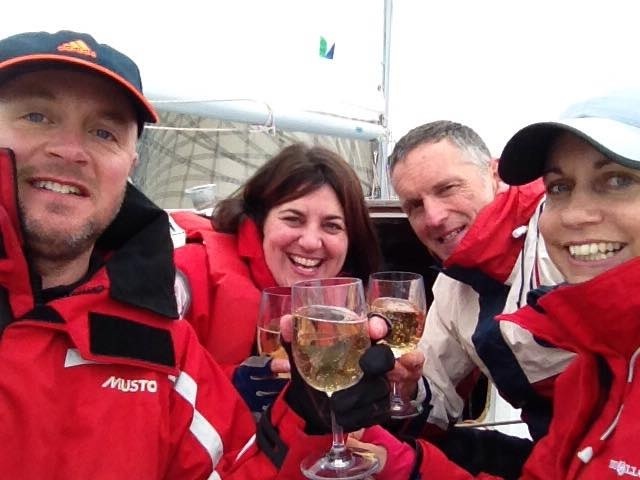 But we made it in time to have a glass of bubbles to celebrate Wildwood’s first wrap outing and the beginning of a new sailing season! She certainly turned a few heads out on the water! There was a beautiful 10kt Easterly breeze blowing down the harbour. The fleet set out in a pack and our lovely friends Flying Machine thought they might have been over at the start, so they turned back. It was nice seeing them behind us for a change! However they caught up to us around the top mark and raced off with their spinnaker flying high – while we cracked open a couple of beers and turned up the music instead! Shall we put the kite up? Nah lets have a beer instead! love being back out on the water! The race was a couple of laps around the middle of Lyttelton Harbour. When we finished, we headed back to the club, packed up the boat and put her back on the mooring and then went up to the club for the opening day festivities. There was a great turn out and the talented Al Park came along to provide entertainment for the evening. Willie and Vonda had made a wonderful cake to celebrate opening day and the joint building venture between the club and Coastguard. 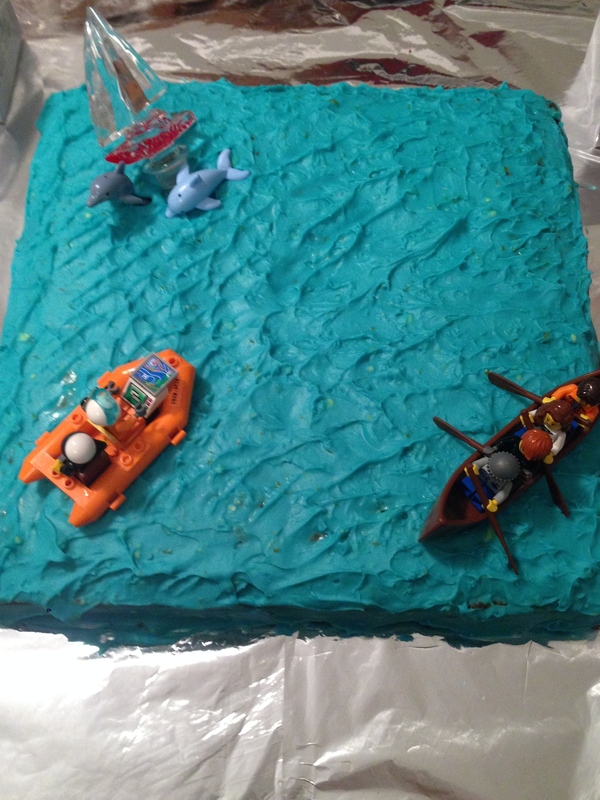 The kids and I decorated it with a glass Wildwood, some dolphins, a waka and a coastguard boat. Opening day cake 2014 – to celebrate the new building venture with the club and Coastguard. 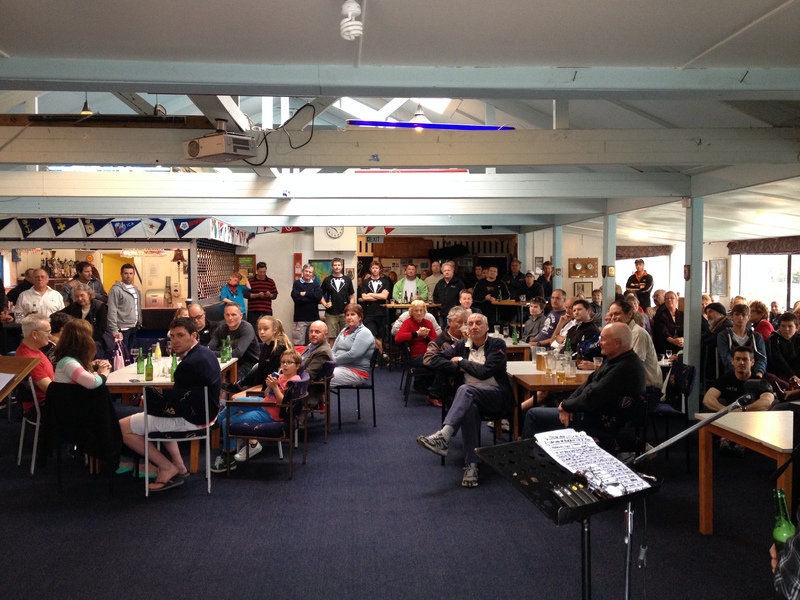 We then had the speeches, prize giving and the annual cannon shot by Mike from Jack Tar Sailing – which left all of us deaf for the rest of the evening! The rest of the evening was spent catching up with friends and listening to the band. Andrew put ‘Puff’ back on the trailer and we headed home. Oh well – I tossed and turned for the rest of the night wondering if I would be able to rescue them… crazy really, but I love those wine glasses! Viki, Sounds like a fantastic day at the club although I would not have been impressed by being woken up for wine glasses and a cannon shot. Putting them stickers on your boat is a nightmare. You get one go and they never seem to want to go on first time. Great to be bad on the water! The number application was a bit nerve wracking! The Boat Coat people did such a wonderful job of the rest of it. I was worried we were going to muck it up. But they came out great! Nicely done with the crystal glasses under full sail! Hey Viki – great news that you found the glasses in the bin! Sounds like you had a great day…I love your pictures.